Transform your Samsung Galaxy into a mobile gaming powerhouse with the Samsung SmartPhone GamePad, which features dual analog sticks and Bluetooth connectivity. Suitable for screen sizes between 4" - 6.3"
Take advantage of your SmartPhone's processor by transforming it into a powerful mobile gaming device. Enjoy blistering game speed and impressive graphics on your phone by combining it with the official Samsung SmartPhoneGamePad. The GamePad connects to your Galaxy wirelessly using Bluetooth. This means that you can insert your smartphone quickly and get gaming without having to fiddle about with connections. 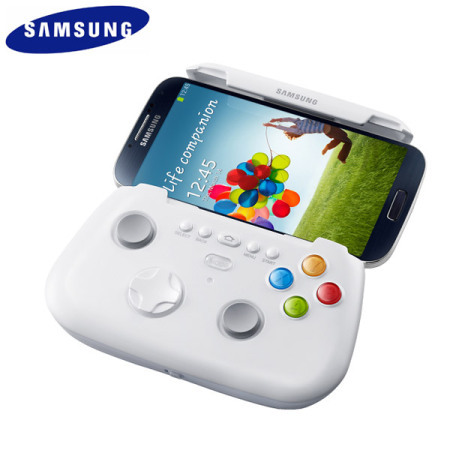 Additionally, using NFC TecTiles you can pair your Galaxy with the GamePad automatically for greater convenience. Designed for most Galaxy smartphones, the Samsung GamePad includes an adjustable clamp design which securely holds your phone securely within the pad so you can game on the go. Because it is suitable for 4" - 6.3" the GamePad can be used with even the largest smartphones. The GamePad includes all of the controls and buttons you would expect on a console-based games controller. These include select, start, back, home and menu buttons as well as four action buttons, shoulders keys, an omnidirectional d-pad and dual analog sticks. This ensures that you can play your mobile games just as you play console games with all the interactivity and gaming performance a quality gaming pad provides.